"Patio weather" seems to have been in shorter supply than usual so far this year but the forecast looks more yea than nay for the rest of the week. 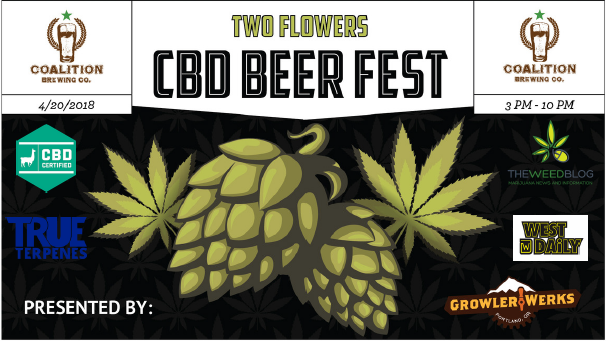 We especially have our fingers crossed for Mother Nature to cooperate on Friday when Coalition Brewing will be hosting their Two Flowers CBD Beer Fest starting at 3 pm. Two Flowers was the first CBD beer Coalition, and in fact any brewery in Oregon, produced. Debuting in January 2017, we have enjoyed it multiple times since then and we are looking forward to trying the other CBD beers that will be pouring at this event. Ensemble, a NW Pale Ale with OG Kush terpenes will also available; it is their latest project with True Terpenes, Portland makers of organic, food grade terpenes. Coalition's gorgeous new patio has been open since March (along with new, open daily hours) so if you haven't checked out this Friday's event is the perfect excuse to do so. Last July we broke off from our beer and Girl Scout Cookies pairing, venturing down a Kettle chips-guided salty road. Since then we'd been toying around with the idea of another chip pairing and last weekend we did the first, of which there may be whole series of, additional chip and/or salty snack pairings. In addition, Dave happened upon our pairing party and contributed a bag of Lundberg Sesame Seaweed Rice Chips. The sweet-spiciness of the chips married well with the maltiness of the StormBreaker, New Holland and Anchor while the darkness of the Culmination provided a nice compliment. Perhaps most surprising was how well the de Garde fruit sour worked, resulting in a sweet heat flavor reminiscent of Burnside's Sweet Heat beer. Not surprisingly the maltiness of the Oskar Blues and New Holland beers offset the heat of the chips. With the Old Chub the pairing took on a spicy tomato flavor and the Cabin Fever highlighted the lime flavor in the chips. Somewhat surprising was that the Pils was able to stand up to the assertive chip. In the case of the Saison, the hot sauce flavor transformed the beer into more of a lager profile. 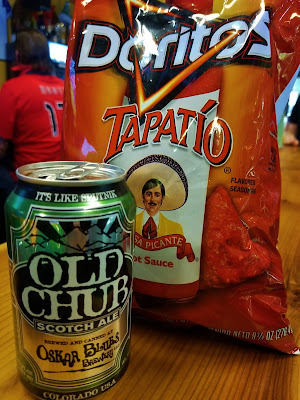 With the brown ale and Scottish ale, similar to the pairing with Chile Limon, the maltiness of the beers complimented the chip's spiciness. 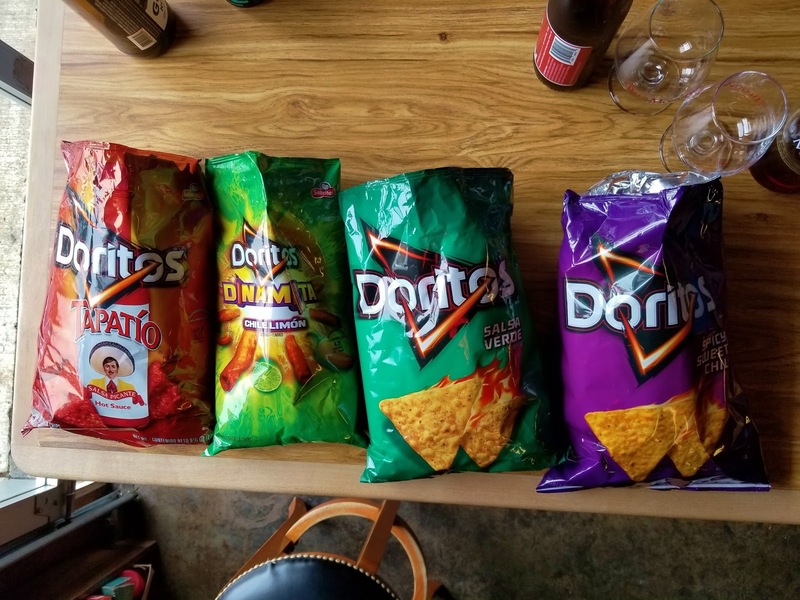 Salsa Verde, the most mildly flavored of the Doritos, turned out to be one of the most difficult to pair with. Level's Ready Player One dry-hopped Saison overpowered it and the peppers were unpleasantly brought to prominence with Oskar Blues Old Chub Scottish Ale. Only de Garde Imperial Peach Bu really worked, with the flavor combination being similar to a fruit salsa one might find on a fish taco. Although we weren't previously familiar with Lundberg Sesame Seaweed Rice Chips the chips on their own had a pleasant flavor and hearty feeling in the mouth. They made for a three-way tie to be second most pair-able with beers that had paired well with other chips. The lightness of the Pils and Saison seemed obvious pairings while Culmination's imperial CDA was quite a surprise. On the surface we assumed that the beer would easily overpower the rice chips however putting more thought into it, the sesame may have been the key ingredient that made it work. Tahini, the highly flavorful paste made from ground sesame seeds, is what gives hummus its distinct flavor and may have been what allowed the chips to stand up to the CDA. For now, however, we'll continue recovering from our salt hangovers. 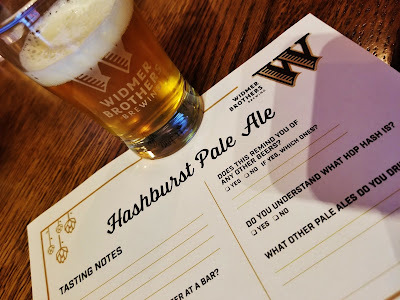 Earlier this week we took part in a 52-person tasting panel at Widmer's recently remodeled pub. 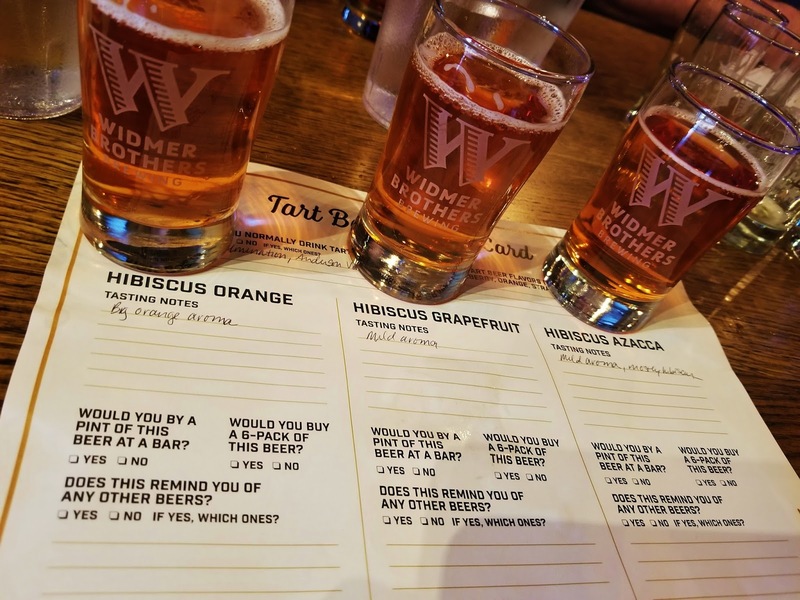 Alerted to it by a Facebook posting, "Become a Widmer Brothers Taste Tester!" it was billed an an opportunity to give their innovation brewmasters feedback on unreleased beers they're working on for next year. Following the link we found an application that was a bit different than we had expected. In addition to asking the reasons applicants felt they were qualified to participate, it asked which breweries applicants bought beer from and/or visited on a regular basis. Not a strange question but instead of a list there was a text box to type in the answer. While the format may have been somewhat random we thought it was an interesting approach to it; we put more thought into it than if we were simply checking the boxes next to a given list. Whatever they were looking for we apparently met their criteria and were notified we'd been chosen. On our way there we pondered what styles of beers we might be tasting. Would their be a hazy offering? Would we be trying things that would be broadly marketable with the intent to be bottled? Would they be pub-only offerings? Arriving, noticing the differences that had been made during the remodel, we grabbed seats next to a couple of familiar faces. The bones of the space have remained the same but the overall feel is more nightclub-esque with a stage and colored lights shining on the brewing tanks that are visible through glass windows. The biggest change however may be that they have ditched the kitchen. With the exception of a few snack offerings - chips and salsa and the like - patrons are invited to bring their own food in. This includes grabbing something from the food truck parked across the street, which on that night was the Chicagoland deep dish pizza truck. But back to the reason we were there - to try the beer. A small group of marketing and innovation brewery representatives got things rolling, introducing the first beer, a pale ale named Hashburst. The pale ales that tend to tickle our palate the most are of the hoppy variety that come closer to being IPAs. This one didn't quite get there but the presence of the hops late palate and in the aftertaste were enough that we would consider drinking this if it ended up making the cut. Next up was actually a trio of beers that featured hibiscus and other ingredients on a Berliner Weiss base. Hibiscus Orange - The huge orange aroma and flavor overpowered the dry-finishing beer. Hibiscus Grapefruit - As with the orange, the grapefruit flavor dominated the beer but then, oddly, all flavor completely fell off at the end. Hibiscus Azacca - Finally the hibiscus got to take the lead with this beer but at the expense of a complete lack of hop character and like the grapefruit version, zero flavor in the finish. 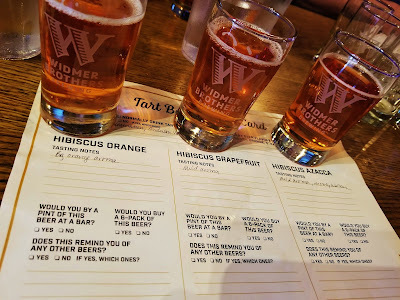 Our impression was that all three of these were "training wheels" sour beers, ones that might play well enough in markets that are not familiar with sour beers on the whole. In a mature market like Portland it would be difficult to imagine them doing well in their current form. The final beers were a pair of terpene-dosed beers. Terpenes are essential oils and in this case essential oils of hops' cousin, marijuana. Dreifecta Pilsner - Huge weed aroma with a cedar backbone, the flavor had more pilsner characteristics with the cedar continuing its presence. Hospitality IPA - A more balanced aroma, the flavor was consistent with that of an IPA with lingering pine-grapefruit notes. Of the two beers the aggressively-dosed Pilsner seemed least successful with its cedar flavor being something that is unlikely to be appealing to the majority of consumers. The IPA had more commercial potential but we were left wondering "why terpenes?" on the whole. Perhaps Widmer is looking to ride the wave of weed's popularity (and legality) without incurring the cost of CBD oil. Who knows, perhaps it will be the next big thing once the hazy craze loses its shine. A. If any of these beers make it to market. B. If Widmer does future tasting panels. C. If we'll be invited back.